Maria Da Gloria Sousa - Edmonton's Burial & Cremation Professionals | Trinity Funeral Home Ltd. 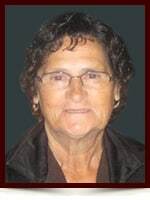 Surrounded by her loving family, Maria Sousa of Edmonton passed away peacefully at the age of 76 years. Left to cherish her memory are her loving children: Zenalia (Brian), Laura (Fermin), Filomena (Manuel), Lurdes (Manuel), Maria, Joseph and Antonio (Paula); fifteen grandchildren, six great-grandchildren; two sisters: Maria (Antonio) and Elena as well as many relatives and dear friends. She was predeceased by her husband Manuel in 2014.